This whole range of buildings belonged to the Lord of the Manor of Datchet from at least early Tudor times to the 1890s. They were built on the edge of the watercourse in the centre of the village and followed its slight curve. Since this was culverted underground in the mid 1800s, the curve of the Greens has represented its course. It seems that the south side of the village centre was a later development than the north, but there is almost no historical evidence apart from the buildings themselves. Further manorial land and buildings extended to the east, past the school and library (both on sites given by the Lord of the Manor) and as far as Green Lane. Datchet’s lords of the manor did not live in the Manor House. 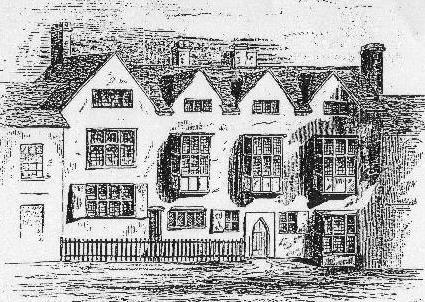 From 1472 to 1630 the manor was a royal possession and a steward or bailiff may have occupied the house. The chief residence belonging to Datchet Manor was the much grander Riding Court to the north of the village and now on the far side of the M4. That estate was leased by the crown to elite tenants, including the Hanbury-Wheeler family who were living there when they bought the Manor of Datchet from Charles Ist in 1631. The purchase included the village Manor House, which continued to be rented to tenants but no records exist before a rental list of 1793. Finally in the 1890s Lord Montagu of Beaulieu put the whole range of buildings up for sale at auction. It is likely that there was originally a main dwelling house with bakehouse, brewhouse, washhouse, outbuildings, cottages and barns strung out along the edge of the pool. 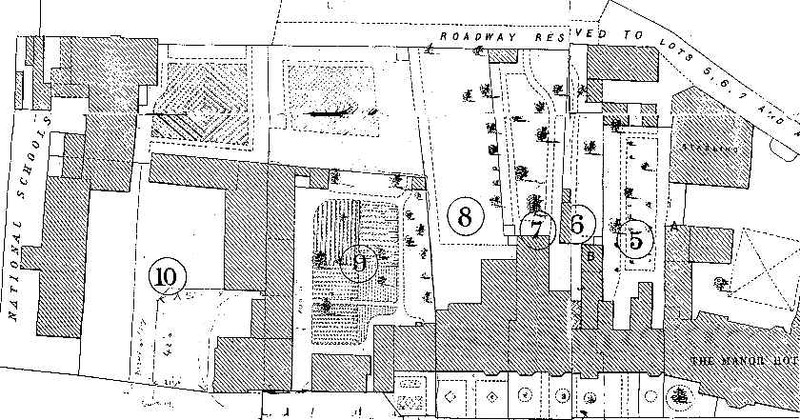 There may have been a manorial home farm here as well, and there was certainly enough meadow land behind the buildings and running down towards the river to house livestock. 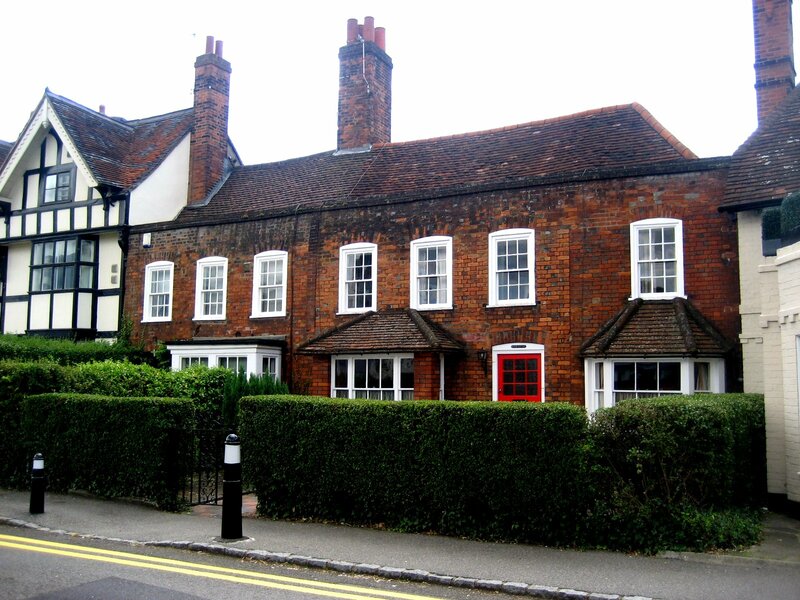 By the mid 1800s the Manor House had fallen far down the social scale; at one time it housed the post office, a parish school and overspill from the workhouse, but also the first Baptist congregation in the village. The other cottages and tenements had become a hive of builders’ and craftsmen’s workshops which persisted into the 20th century. 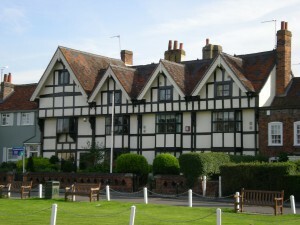 In the 1870s the main house was remodelled, including the addition of a smart mock Tudor timbered facade, to be let out at higher rents to more respectable tenants. All the dwellings were rented directly from the Lord of the Manor until eventual sale. In the 1950s several derelict buildings were bought for development, so that the present Grosvenor Stores and the W.I. Hall with its shops are insertions into what remained of the original manorial range. In 1896 Lord Montagu of Beaulieu hoped to sell the whole range at auction, and though not all were actually sold then, the auction catalogue and plan describing each lot is a very useful source for identifying each building at that date. This tiny building may be earlier than any others in the range. 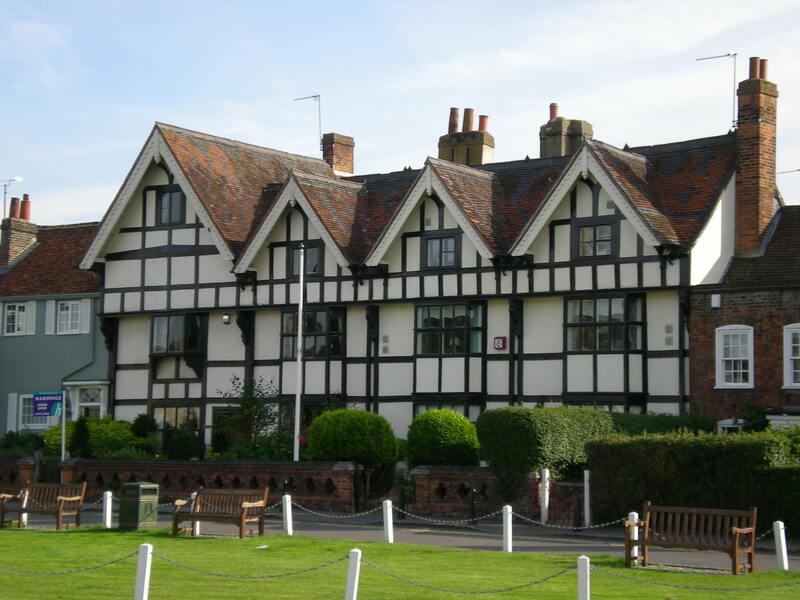 It is a genuine timber framed building which was given a mock timbered facade in the early 20th century. 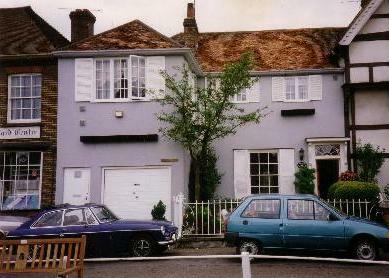 Its name is due to the new Datchet Parish Council having rented the two front rooms as an office from 1895. 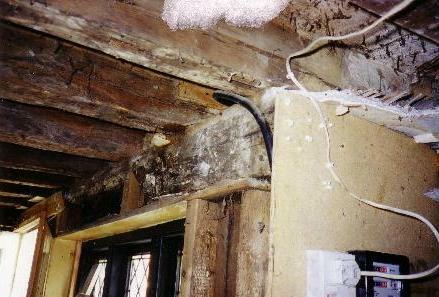 Some years ago the whole ground floor was completely stripped out and rebuilt, uncovering the original timber frame. It was fully photographed during the work but a lot of reconstruction with modern materials had to be done for use as modern offices. 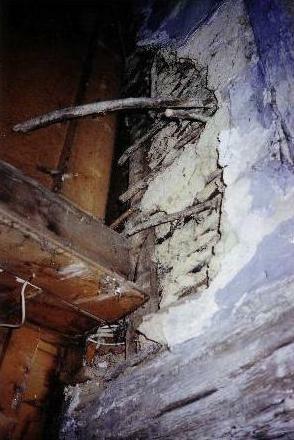 One section of wattle and daub wall has been left visible within the restored building. On the east side of the house is a later extension with a curiously low chimney on the corner. During restoration a well was found within the extension, which would originally have been in a yard beyond the outside wall of the house. The house was bought in 1953 by the building developer George Scott as part of a property extending west to the main Manor House, but did not rebuild this house. Censuses recorded the Sears family of builders living and conducting their successful business here from the 1850s to the 1880s. Edward Sears was followed by George Charles Sears, both employing six men plus boys. By 1891 Ernest K Willett, another builder, was also managing Datchet Coal Company here, in the yard adjacent to the school. Despite its name, which was in use at least by the 1940s, there is no evidence that this house is earlier than any of the others in the range. 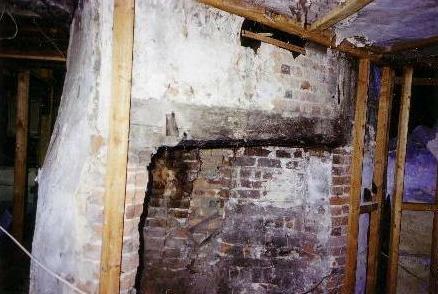 It could date from the 1600s but was so much rebuilt by George Scott in 1955 that the original building is untraceable. 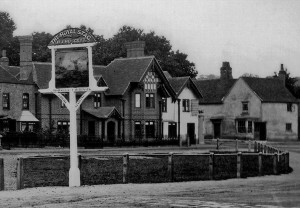 This photo, probably taken in the 1870s, shows the buildings which George Scott incorporated into Old Manor House or demolished to build the WI Hall and its shops. By the 1950s they had been little changed and Scott’s work was certainly an improvement. The single-storey workshop was known as the ‘Shepherd’s Hut’ within living memory. The old house and its workshop were occupied by several generations of the Bidwell family (builders and plumbers) from the 1790s to the 1890s and was sold to the Cleversley family (also builders) at the 1896 auction for £600. George Scott built the Hall as a gift for the W.I. as he was impressed by his wife’s work in the organisation, and remodelled Old Manor House as a wedding gift for his daughter. She was also the first manager of the Grosvenor Stores which Scott had built next to Old Council Offices. At first glance the 1858 drawing is scarcely recognisable as Datchet Manor House, but there are clues in the number and height of its gables, windows and entrance doors. The house is a timber-framed building, probably dating from the late 1500s with a higher cross-wing on its east side (number 1) added, probably in about 1650. In the past it was a fashionable alternative for timber framing to be concealed on the outside by plaster rendering, but in more recent times people have wanted the timbers to be visible in the façade of a house. 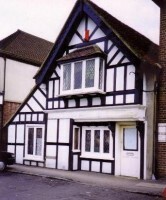 The addition of purely decorative timbers and patterned roof tiling, as was done here in about 1870, is described as Mock Tudor or Mock Jacobean. 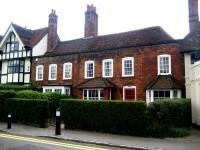 It has become Datchet’s prevalent style, but the earliest example in the village is here at the Manor House. The skilful integrated different original levels into a comprehensive design. 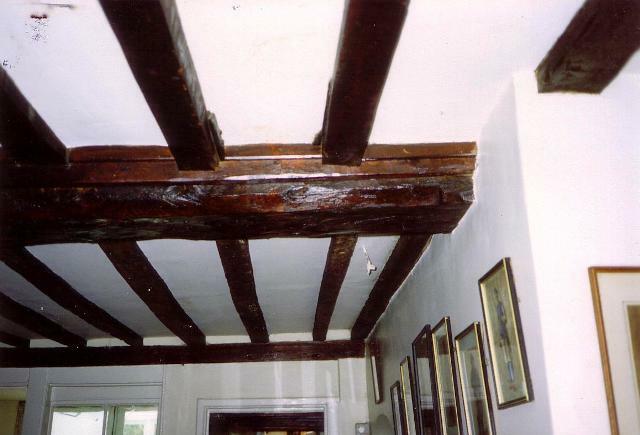 The genuine Tudor and Jacobean timber frame, as well as hearths and an original staircase, remain complete inside the building although little is visible in the western half (number 2). The houses were updated internally at the same time, all done with the intention of attracting higher status tenants (and rents) than the artisans and tradesmen who were its occupants. Neither house was sold at the auction and Charles Killick finally bought both from the Montagu estate in 1929, living in number 2 and subletting number 1. Legal papers at Beaulieu show that building work was done at that time, but perhaps only to number 2. 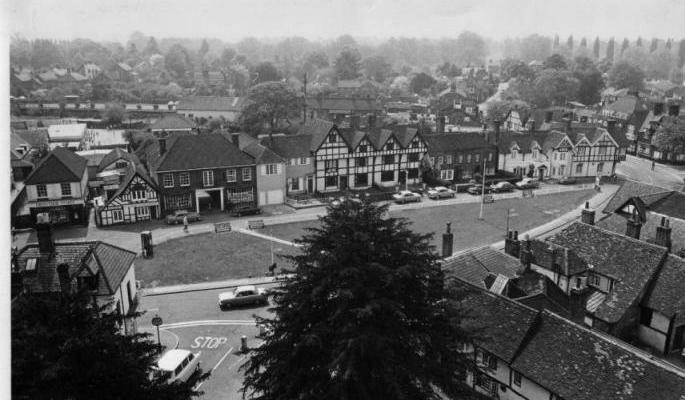 In 1961 a legal case established that although Killick had bought the Manor House that did not entitle him to the ‘lordship’ and Lord Montagu was confirmed as Lord of Datchet Manor. In 1906 one of the halves was leased from Lord Montagu to Mrs Lydia Gertrude Sopwith, although the occupier was her son-in-law Francis Raikes. This was the family of Tommy Sopwith and the reason for his flying visits to Datchet, landing his plane on the golf course in 1911. In 1896 these two houses were described as a Private Residence (no. 2, on west), let to Captain Chisholme at £45 p.a., and a Dwelling House and premises (no 1, on east), let to Arthur Druce at £40 p.a. Number 2 was both bigger and better equipped, with hot and cold water supplies in the bathroom. 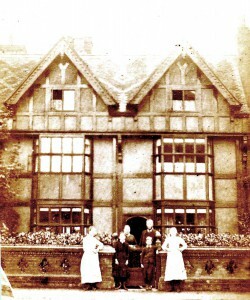 This photo is of John Cameron with his wife and children outside number 2 Manor House; he was a member of the Royal household at Windsor until 1892. From about 1830 until the 1880s the eastern house was occupied by John Hunt, builder and Postmaster, and his family; the Post Office was in the room to the right of the door. In 1871, after John Hunt’s death, his wife Ann was listed in the census as Post Mistress and also took in lodgers. Before 1830 and back to 17801 this house was occupied by William Hughes, ferryman, and then by his widow, who had inherited the tenancy from her uncle David Ogilvy. A ferryman was needed from 1795 when Datchet Bridge over the Thames had fallen and the Crown re-instated a ferry service until the bridge was rebuilt in 1811. From about 1850 back to 1780 the western house was occupied by shoemakers, the Philbys and Bamptons and before them the Willdays. In 1801 some part of the Manor House was licensed for use as ‘a Meeting House by religious dissenters under the denomination of Baptists. The license describes the house as ‘the dwelling house of Her Grace the Duchess of Buccleuch, occupied by William Hughes’; not the house in which she dwelt but one of these houses which she owned as Lady of the manor. It is very likely that rooms would have been sublet and occupied as a warren of tenancies while only one family was officially recorded. As well as William Hughes, the application was signed by Francis Willday and Charles Buckland who was then at Old Manor House. Shoemakers and menders are traditionally associated with religious dissension and there seems to have been an active group of similarly minded families in this row of dwellings, who in 1841 had helped to establish the Baptists’ Chapel in the High Street. 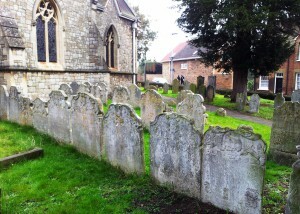 More than twenty graves of the Ogilvy, Hughes, Aldridge and Marsh families are lined up on the south side of the church, re-sited when the church was rebuilt. 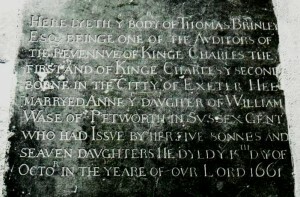 These related and intermarried families were rich enough to erect tombstones here from the 1690s, although most of the stones are nearly illegible now. Several were Freemen of the City of London. There are no documents listing tenants of the Manor House before 1795, but circumstantial evidence and family wills strongly suggests that various Ogilvys, Hughes and Aldridges lived here from the mid-1700s. They were able to inherit the tenancies which they held from the Lord of the Manor, although some of this wealthy and prominent group possessed properties and land of their own. From around 1600 there was a close-knit group of Auditors of the Royal Revenue based in Windsor, Eton and Datchet. 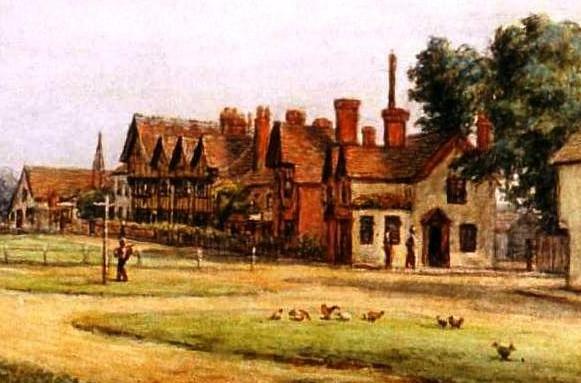 They managed Crown property and arranged sales for monarchs short of money, the post combining skills of an accountant, a surveyor and an estate agent, Richard Budd is the first auditor known to have lived in Datchet in the 1620s and his partner Thomas Brinley by the 1640s. Although the evidence is again circumstantial, it is fairly certain that Budd lived in the Manor House, followed by Thomas Brinley and the family of his wife Anne Wase. From Brinley’s will and the inventory of possessions in his house at his death, it is clear that the whole house was occupied as one dwelling and its division into two tenancies occurred later. Brinley’s gravestone in the chancel floor of the church is of interest to Americans because several of his children were sent out to establish new lives on Long Island, New York, in the 1650s when the Civil War had made life here precarious for a royal official. He was reinstated when Charles II was restored as king but died very soon after, in 1661. At least one of his daughters remained here and may have continued to occupy the Manor House to the end of the 1600s. The Manor Cottages are also timber-framed buildings and may be older than the Manor House, into which their structure is embedded at the east end. Probably also built as one dwelling originally, they were fashionably updated long before the Manor House was re-fronted. At some time in the late 1700s or early 1800s the whole building was given a symmetrical brick façade with modern Georgian sash windows, but the interior was left untouched. 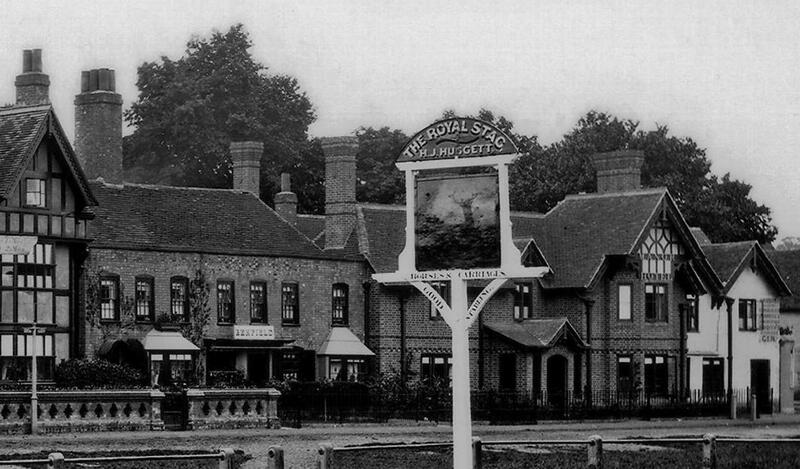 The bay windows are later but before 1896, as is the short western extension abutting onto Manor Hotel. Also like the Manor Houses, the timber frame of the east half is still exposed inside but that of the west half has mostly been plastered over. 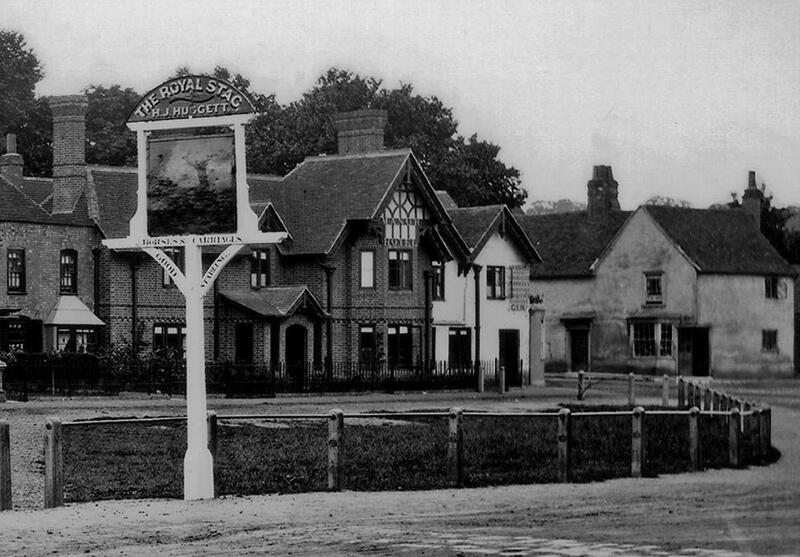 Before becoming a shop in about 1890, Manor Green Cottage had been the home of the Dilly family back to at least 1840. Censuses recorded William’s wife Elizabeth at first living here with her children and later joined by William as a pensioner, having been a butler for the Buccleuch family at Ditton Park . As Lords of the Manor, the family owned Manor Cottages and used this dwelling to house elderly servants, though the Dillys may have been especially privileged. Manor Cottage had been Richard Benfield’s butcher’s shop in the 1870s and 1880s, and before that was occupied by the Tucker family of butchers back to 1840. Another of the Ogilvy family and the related Bradleys were here in the 1780s, possibly running a baker’s shop. Little is known about the history of this building, except that it was part of the manorial range and has been an inn since at least the 1750s. The building probably has a core dating back to the 1600s, but there have been so many alterations that nothing from that period has been identified. It is not known when the hotel was finally sold by the Montagu estate or to whom, but it was not for sale at the 1896 auction. These two 1870s images show that the main façade and entrance of the hotel had been recently rebuilt, or just re-fronted, in red brick with mock timber patterning in the gable. 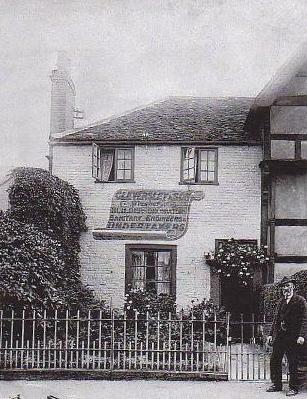 A smaller building on the corner of the High Street, probably the public bar for locals, remained as a much older white-rendered house. It too was rebuilt in 1888 with the overhanging corner structure as we know it now. 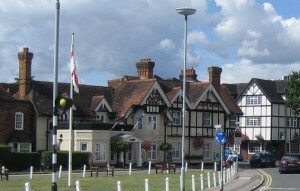 The Lord of the Manor also owned the building on the opposite corner of the top of the High Street, seen in the photo as a white-rendered building with its entrance set diagonally on the corner. This had been a public house called the White Hart, first mentioned in 1565. It was rebuilt by the Lord of the Manor in the 1880s as a shop (for a long period occupied by Hawes Bakery) and again rebuilt in recent years, currently occupied as a wine store. The White Hart and the forerunner of the Manor Hotel were both in business through the later 1700s, sometimes run by the same publican. The Manor may always have been more prestigious, and had stabling in the yard behind reached by an archway in High Street, now an internal part of the building. 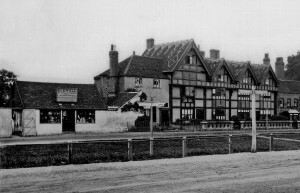 The White Hart was a lower status alehouse with a skittle alley at the back on the site of the present offices’ car park. The story told about the hotel being used as a mortuary is true and not at all unusual. When an inquest had to be held after an accidental or suspicious death, the body would be viewed by the coroner at the chief inn of the place where the victim was found.